Moments before Bob Dylan began his first concert appearance in eight years, the backstage area at Chicago Stadium last week was eerily quiet. Reporters, who had swarmed in from every continent were barred – except a Newsweek reporter. There were no wives, no groupies, no hangers-on. In one small room Dylan and members of his accompanying group, The Band, twanged a few chords. In another room someone had left Dylan a surreal set of props: grotesque rubber masks, a stovepipe hat, a Keystone Cop helmet – even a crown. But for this first concert of his heralded return, Dylan disdained the disguises. When he stepped out onstage, the 32-year-old Dylan, the elusive, reclusive poet-songwriter whose songs of protest and love sparked, sensitized and inspired an entire generation, was the Dylan everyone remembered: skinny, hunched over, dressed simply in blue jeans and black wool shirt, an old muffler thrown round his neck. Time had filled out his face slightly and given his voice a strengthened authority. Like a poet laureate, in the early ‘60s Dylan found the words that expressed a prophecy and a state of mind: “A hard rain’s gonna fall . . .” “Something’s happening here. You don’t know what it is do you, Mr. Jones?” “You don’t need a weatherman to know which way the wind blows” (which gave the violent Weatherman group its name). Ironically, as if to mark the end of an era, on the day Dylan opened last week Federal Judge Julius Hoffman dismissed indictments against twelve Weathermen for their “days of rage” rampage in Chicago five years ago. The question was: what was Dylan’s new message for the 70s? To get the answer, 19,000 fans, many busing, hitchhiking or driving hundreds of miles, braved a freezing Chicago evening to see and hear the minstrel who withdrew in 1966 at the height of his fame, told the world to get lost and like Garbo, raised the status of celebrity to myth. These people in the Chicago audience were not the screaming teeny-boppers who come to the saturnalias of the new pop stars like Alice Cooper. These were eager, expectant people, mostly in their 20s, who sat patiently as the house lights went down and only an occasional whiff of marijuana arose. 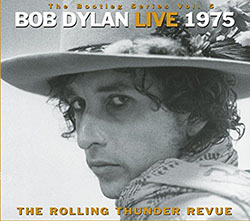 When Dylan finally walked calmly out, turned his back to the audience and began tuning up with Rick Danko, Levon Helm, Garth Hudson, Richard Manuel, Robbie Robertson – the gifted members of his original backup group, The Band – the audience cheered him not with the demoniac sounds of Mick Jagger’s vicarious street-fighting men, but with the healthy gladness of friends greeting a long-absent friend. Dylan came on without gimmicks. His songs, at their best, were dynamite, cutting through the crowd like a laser beam, the substance and mastery of the lyrics standing out in stark contrast to so much of the theatricality that has taken the place of music in today’s rock world. Dylan and The Band did 28 songs – all vintage Dylan except for three new ones from his forthcoming album, “Planet Waves.” Like pro athletes coming off a long layoff, their playing was ragged, almost deliberately unassuming. But the mood changed in the second half of the show when Dylan – who never spoke during the concert except to announce the intermission – walked out alone, his black shirt replaced by a snow-white tunic. When he picked up his acoustic guitar and began blowing his harmonica, Dylan started blowing a few minds as well; when he wailed “The times they are a changin’ ” the audience roared. It was both a memory and a promise. When he sang “The Lonesome Death of Hattie Carroll,” the song about the death of a black woman killed by a cane carelessly thrown by a Maryland society snob who beat the rap “through high office relations in the state of Maryland,” the reference to Spiro Agnew was perfectly clear. Dylan spat out the final words like a challenge. After eight long years the most important single personality in the American popular culture of his generation was back. 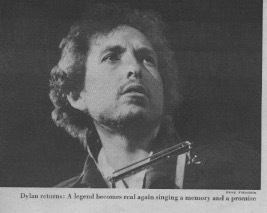 “This event is the biggest thing of its kind in the history of show business,” modestly declared David Geffen, the 30-year-old human dynamo, “Record Executive of the Year,” chairman of the board of Elektra/Asylum Records, who just pulled off one of the great coups in the music business – signing Dylan away from Columbia Records. When newspapers carried an ad last Dec. 2 saying Dylan and The Band would be touring 21 cities for six weeks in January and February, the post office was flooded with millions of envelopes. Only mail orders were accepted because Dylan wanted all age groups to have an equal chance to hear him, not just the kids who would stand in line at the box office for days before. Even so, the scramble for tickets has become frantic, including magazine ads offering bodies in exchange for tickets and scattered instances of counterfeiting. The total concert capacity was 658,000, and Geffen estimated 2 million to 3 million envelopes were sent back. With prices as high as $9.50 and $10.50, the concerts will gross a cool $5 million. Dylan’s motives for doing anything have always been questioned by his idolatrous masses, and after a near-fatal motorcycle accident in 1966 he withdrew into seclusion in Woodstock, N.Y., with his wife, Sarah, emerging just four times to perform, most notably at the concert for Bangladesh. Since then he has shunned interviews, occasionally released albums, popped up in Sam Peckinpah’s film “Pat Garrett and Billy the Kid” and moved with his family from Woodstock to the beach at Malibu. Back in his hotel suite after his performance, in the company of a longtime high-school friend, Louie Hern, who knows him from Hibbing days when he was Bobby Zimmerman, Dylan is quietly watching an old Western on TV. The wool muffler is still wound around his neck. In person he’s not nearly so hard-looking as his photographs – he seems almost fragile. A little later when everyone has gone, Dylan is remote but not unfriendly. When Dylan mentions the marketplace he knows what he is talking about. He is one of the two or three most valuable properties in the multimillion-dollar-a-year pop-music business. Columbia Records, his previous label, was not unaware of this situation. When Dylan’s contract with Columbia Records ran out last year he did not renew it, switching to Asylum instead. Columbia immediately got up an album filled with Dylan “outtakes” he had discarded in the studio long ago. Columbia promised Dylan that if he re-signed with them the album would not be released. He didn’t and it was. But Dylan has his own kind of charm, which he can turn on even in the presence of the media. He walks around his hotel room balancing a straw boater on his head, reacting enthusiastically to stories about country singers, such as Dolly Parton’s armory of wigs. 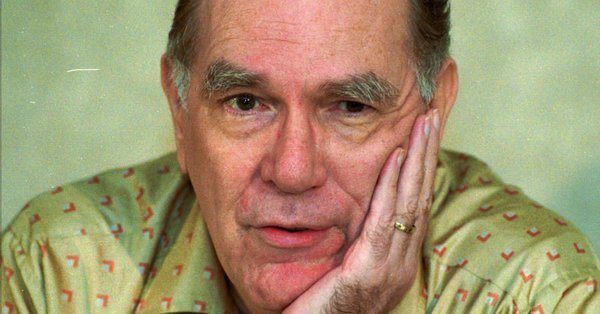 He talks about books – especially books that have the word solitude in their titles – “A Hundred Years of Solitude,” “A Woman Called Solitude”. As an artist Dylan seems to have found confidence. As a performer he’s more relaxed. “A lot of the nervousness has gone. 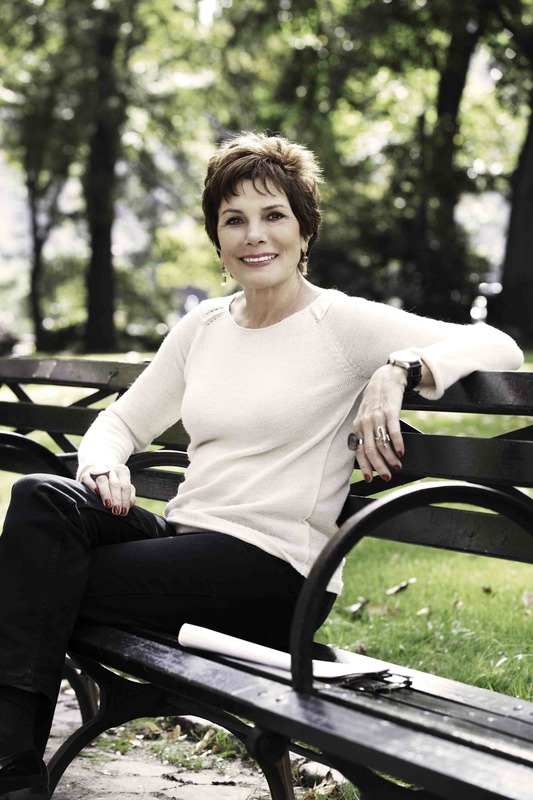 I used to feel nervous all the time before I went onstage.” As a husband and father (five children) he has found profound love. I’m searching for a gem.